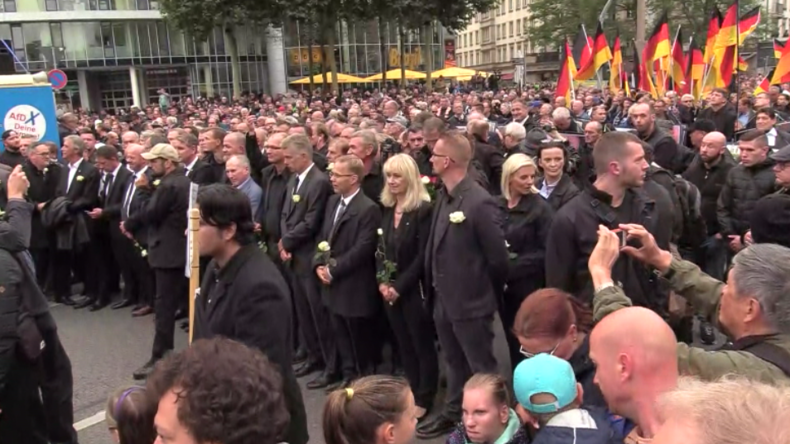 The AfD (Alternative für Deutschland, Alternative for Germany, the third largest party in the German Federal Parliament) called for a “Grieving march” for Saturday, 1 September, in Chemnitz. Apparently about 8000 people came to the demonstration which was also supported by the organizations “Pro Chemnitz” and “PEGIDA” (“Patriotic Europeans against the Islamization of the West”). “Pro Chemnitz” originally had its own, separate rally earlier during the day, but after that rally ended, participants of the rally joined the AfD march which was supposed to start later. It was supposed to be a “silent march”, that is, no loud slogans were allowed. Also, no symbols or flags were supposed to be carried by the participants other than the German flag, except, in the front of the march, pictures of Germans killed by migrants over the last 2-3 years. As the Police report says, more than 1800 policemen secured the events of the day (which also included several other demonstrations). The march had a 1.5 hour delay, during which the participants were waiting, talking with each other and listening to announcements by the organizers. The reason for the delay was apparently that the police requested additional security personnel from the organizers of the march because the number of participants increased when “Pro Chemnitz” rally participants joined. Finally, the march started at around 6:45 p.m. The AfD march in Chemnitz, Saturday, 1 September. The march was stopped soon after it started by the Police, without explanation. When asked, the Police couldn’t (or maybe didn’t want to) give a reason for the stop. Tension was in the air. Participants of the march felt that the authorities were trying to sabotage the rally first by delaying it and now by stopping it. Some people suspected that leftist demonstrators were blocking the route of the march further down the road (not an unreasonable assumption as they have done exactly that during the demonstration on previous Monday) and that the Police won’t remove them. The Police wasn’t able to secure our peaceful march. We had to cut our march short, and we have done it deliberately because I foresaw that we could get into a confrontation, that there will be fights, pictures of which some would like to see, but which we wanted to avoid at all cost because our march today was going to be a grieving march. The Police report of the events only states that the organizers cut short the event but says nothing about the reasons: the Police stopping the march which it without doubt did, as shown in the above video. It was declared a “grieving march” [“Trauermarsch”]: the police secured a demo of right-wing extremists with a large contingent. An escalation with counter-demonstrators failed to occur. But meanwhile AfD and Pegida walk side by side. This kind of reporting was new, even for the German media. Up to that point the AfD was described, in general, as “rightist-populist”. As we’ll see later, the SPD, the leftist coalition party of Merkel’s government started to ride this same wave and started demanding that the internal security service—the “Verfassungsschutz”—starts observing the AfD or its sub-organizations. It appeared as if the generally leftist media and leftist politicians were in a kind of frenzy of “fighting the right” since the beginning of the week, feeding constantly at each other and venomously attacking everything in sight that looked “right”. It was a kind of vicious circle from which these people could not—or did not want to—free themselves and which acquired its own dynamics, despite the fact that by now the original triggers, the “man hunts” against foreigners, Nazi salutes and the like were missing. Another characteristic feature of this frenzy or mass hysteria was that the picture of the week’s events painted by the media was extremely distorted. The fact that the large majority of the demonstrators on the previous Monday was completely peaceful was disregarded, just as their reasons to demonstrate. The focus was almost exclusively on the, in comparison, very small minority of far-right trouble makers, the “far-right mob”. Also, with the exception of the Chemnitz Freie Presse—and of alternative, internet-based media—no newspapers up to this point questioned the validity of the “man hunt” allegations or demanded evidence. The fact of the “man hunts” was simply given and the inconvenient truth that, as support for those there was only a single 20 seconds long video, with unknown context, one German man chasing after a foreign looking person a few meters—the “Hase, du bleibst hier” video—was disregarded. According to all the information available to us, there was no “man hunt” in Chemnitz. This was now not just a regional newspaper which disputed the narrative of “man hunts” committed by raging “right-wing mobs”, accusations fully embraced and actively spread by the Merkel-Government, but the local authority, responsible for prosecuting such crimes. More cracks like this were to appear later.